The "fantastic village" was the prize-winning design in a competition for play equipment held by the Museum of Modern Art in conjunction with a play equipment firm and parents' journal. It consists of five different types of house, each five feet high. The prefabricated parts of reinforced concrete can be assembled into a number of configurations as roof or wall elements can be adapted to each of the various age groups. The openings, which serve as doors and windows also give convenient holds for feet or hands for climbing, as do the attached ladders and climbing bars. Designed by Joseph Brown of Princeton University, Princeton, U.S.A. The designer began designing with the assumption that the child should learn to grasp the unpredictable and therefore adjust to the diversity of the environment. Therefore the playground is designed to challenge children's abilities, to stretch their limitation, and that constant change is the principle of life - by accommodating a number of uses. The jingle-net and swing-ring is designed for children of any age - and consists of tied rope to a steel core. "The children need agility and swift reactions not only for grasping with the ropes, but also for adjusting themselves to the unexpected shaking movements caused by the other children." Left: A play sculpture at Mennheim by the sculptor Nagel. Middle: The saddle slide - made of polished reconstructed stone set in a mould - thus cast in situ. Right: Play sculpture by Piere Jeanneret (Le Corbusier's cousin) at a playground in India. Play sculptures designed by Moller Nielson, which incorporate caves, crawling ducts, climbing structures and slides. Play sculptures designed by Robert Winston, U.S.A.
Made out of a skeleton of tubular steel, covered with expanded metal and three layers of cement mortar. Named the "monster" by adults, this play sculpture is a ship, aeroplane, a cave, hillocks, a look-out r jumping platform to the children. For smaller children, it serves as a crawling tunnel, a house or a table for sand pies. It shows how differently a child's imagination interprets a plaything, accommodating multiple uses. Vest Pocket Park and Playground in Manhattan, New York, U.S.A. This park in Manhattan not only served the children, but offered young people and elders who had little chance for direct contact with nature, creative leisure activities. Not only was it a playground, but was intended as a centre for learning about the natural sciences. This scheme was part of a larger programme, with each centre intended to focus on a different facet of natural science. Here (seen in the section) is a dome in the centre of a pyramid, featuring a planetarium, hidden beneath the playground. A laboratory also below ground has work tables for individual research. Vest Pocket Park and Playground in Brooklyn, New York, U.S.A. Despite its small size and simple facilities, this playground provided the children of Brooklyn with a play space, where before they could only play in the streets of abandoned refuse-cluttered lots. Friedberg created his "vest-pocket" playground to fit in with its surrounding environment and using local community labour of al ages. The playground inspired a number of renewal schemes after its completion. 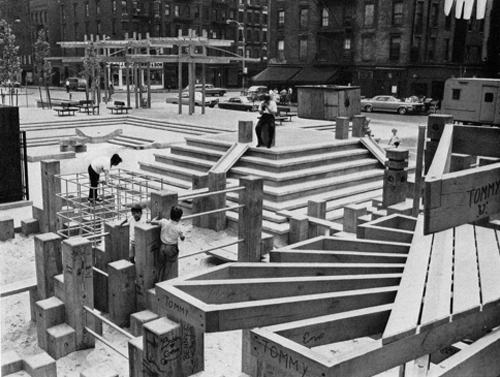 In conjunction with the New York City Housing Authority, the Museum of Modern Art and the Park Association, three experimental playgrounds were built for the Cypress Hills housing scheme, in Brooklyn. The first is shown here. They were intended for 3-8 year olds, to be unsupervised and were built with "indestructible materials" like concrete. 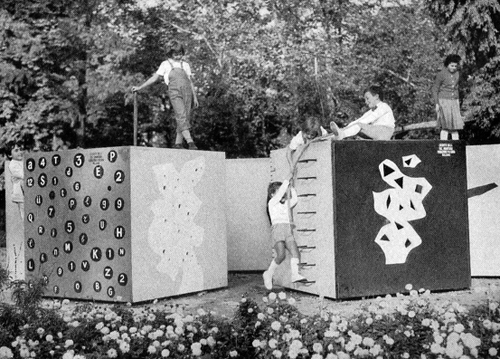 The forms were designed to foster children's movement, whilst offering different types of space for children to hide in, run through or climb, and in which to imagine and make up games. 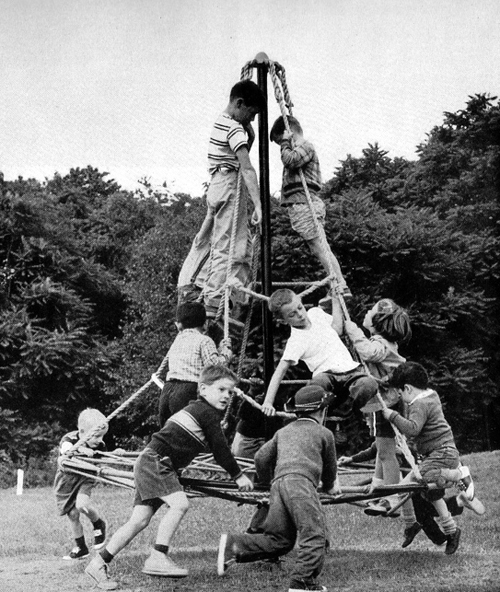 The playground included a forest of concrete slabs, a tower, with a spiral stair and slide, a group of half cylinders for mountain climbing enclosed by a low ramp and a spray fountain. A spherical fixture lights the playground in the evenings. Left: Part of the playground. Left: Plan of the first completed playground - showing the vertical concrete slabs, which enclose the inner circle. Wood slat benches are placed along the outer ring by the entrance. The creative Centre introduced to the visitors of the Canadian Pavilion advanced methods in teaching music, art, drama and in nursery education. It consisted of four classrooms, where activities could be observed through one-way screens. The playground designed on the adjacent open space offered a variety of possibilities for active and creative play, as well as a section for quiet play containing a manipulative wall with a series of art puzzles for the children to arrange in infinite ways. Free standing screens made up of different musical instruments - strings, bells, drums and xylophones and playtables, as wel as a climbing net and story telling area with moveable bookshelf are included also. The hexagonal nursery leads off the main open space - with a sand and canal area, a mound with tunnel, slide and treehouse, as well as a flat space for building games. Left: Perspective drawing of playground, and right: site plan - you can see the hexagonal nursery. Left: the treehouse, accessed by ladder, rope ladder and climbing tree, and a sliding pole for getting down quickly. Left: Beams and boards for all kinds of building games. Right: Between the two sand islands a boat. Pepsi-Cola Playground, New York, U.S.A.
With the support of the Pepsi-Cola company Company, a graphics and exhibition designer, Jerry Lieberman, devoted two years' work to developing novel playthings, which consist entirely of standard products of the plastics industry. A temporary indoor playground was arranged with these objects, in association with the National Recreation and Park Association, in the entrance hall of the Pepsi office building on Park Avenue. The brightly coloured plastic modules are arranged as a play town. Fibre glass cylinders in three lengths form bases of different heights and tubes to climb through. A variety of openings have been cut in the sides to make windows and doors. Each of these examples share a spirit of the times - of modular components for free play (influenced perhaps from the adventure playgrounds in Europe), and an experimental approach of using a diversity of materials - including the first uses of plastic, offering the benefit of being colourful and 'safe' for the children). Each show what can be achieved when artists and designers put their creative talents into creating spaces for children - vibrant public spaces for all.